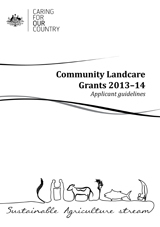 The Australian Government is seeking grant applications for Community Landcare Grants. The Community Landcare Grants are the small grants component of the Sustainable Agriculture stream of the Australian Government’s Caring for our Country initiative. They are designed to support the natural resource management community to ensure Australia’s agricultural base is sustainable, productive and resilient. Community Landcare Grants build on the success of the earlier Community Action Grants, with a renewed focus on sustainable farming and fisheries, agricultural innovation and community capacity building. encourage the adoption of improved sustainable land management practices. Local community groups and professional farming systems groups involved in sustainable agriculture are encouraged to apply. Applications close 5pm 20th March 2013.